Regular Physical Activity is one of the most important things you can do for your health! The City of Cape Girardeau Parks & Recreation has tons of great options for you! 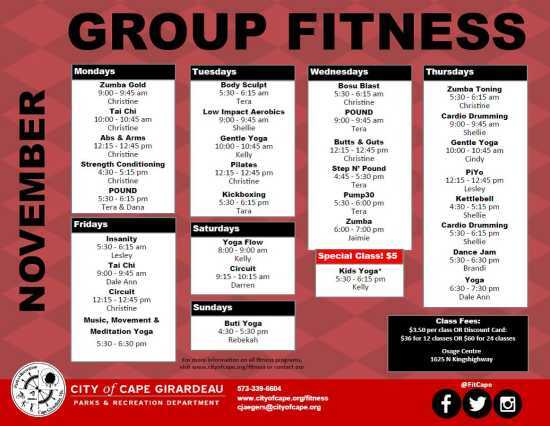 We have over 15 different Group Fitness classes available each week held at the Osage Centre. We have a wide variety of classes for all levels and ages! Mondays: Zumba Gold @9AM. Tai Chi @ 10AM. Tuesday: Low-Impact Aerobics @9AM. Gentle Yoga @ 10AM. Thursdays: Cardio Drumming @9AM. Gentle Yoga @10AM.